Cozy and casual, cottages are a charming home style that’s become popular in interior design. Whether you have a small cottage of your own, or just want to exude a bit of cottage style, blogs are a great place to learn about cottage home trends and projects. We’ve discovered 15 of the best cottage home blogs, featuring beautiful cottage home tours, inspiring DIY tutorials, and a wealth of casual living resources. 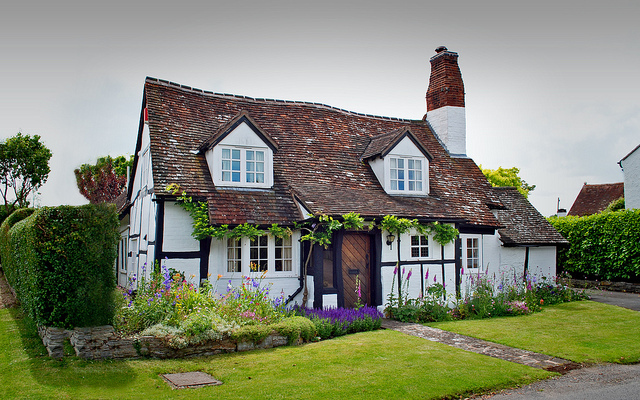 Check out our favorite cottage home blogs to find the best of cottage living online. Join Gina at The Shabby Creek Cottage as she shares creekside life in a shabby little cottage. Gina shares all of her custom home projects and loves to share what’s she’s learned during her cottage home adventures. Laurel and Richard at SoPo Cottage love working on old cottage homes so much, they’ve made it their full time job. They share their passion for renovating old homes on this blog, sharing before and after updates on 5 cottage projects, with more to come. Sarah at A Beach Cottage lives in an old white cottage off of the Australian seas. Her blog is all about cottage renovation and vintage coastal cottage style. Visit her blog to learn about her cottage lifestyle by the sea. Layla at The Lettered Cottage blogs about her cottage home and lifestyle in deep South Alabama. She loves to solve design dilemmas and style interiors. Follow The Lettered Cottage to see how she’s working to make her new house cottage chic while helping friends with their interior design. Sarah’s obsession with cute white cottage style is on display on the Cozy.Cottage.Cute blog. She lives in a 1940s home, and is taking her time renovating it. Follow the blog as she works on her “Project ADD,” a condition that causes her to work on one room for a while, then move on to another, and then maybe back to the original one after completing a few more projects in between. Read about Kelly’s adventures in her Michigan lake cottage home. Her blog chronicles the chaos and accomplishment of her creative repainting, redecorating, and renovations in the cottage on the lake. Projects include planked walls, a nautical bed, coastal furniture makeover, bookshelves, and more. Jami at An Oregon Cottage loves everything about farmhouse cottage style living. Though she lives in a 1982 ranch house, she’s embraced a cottage mentality, meaning her family lives simply and embraces imperfections. Her blog exudes the cottage lifestyle of living small with warmth and character, sharing recipes, remodeling, garden successes, and frugal tips. On Forever*Cottage, professional interior decorator Jill shares her passion for design and living well. Read her blog to find out what this pro has to say about designing the cottage home of your dreams. Jeannine at The Concrete Cottage has a constant craving to create, and she shares her projects here. Follow along as she works on her craft room, paints everything white, and makes custom artwork and home accessories. Featuring everyday cottage style, Fox Hollow Cottage has great ideas for making any home more cozy and cottage-like. Shannon loves to share DIY improvement projects, crafts, and holiday ideas. Check out the blog for kitchen cabinet updates, painted chairs, and closet makeovers. Karen blogs from her desert cottage in Arizona, celebrating all things vintage and aged. Her Desert Cottage Blog features tutorials, arts and crafts, gardening, thrifty finds, and home decor, with plenty of useful and inspiring posts for cottage home enthusiasts. You’ll find projects including a repurposed doors headboard, twine and lace Easter eggs, and chalkboard kitchen cabinets. Shayna at The Wood Grain Cottage is a home and DIY enthusiast living in a Colorado cottage farm house. She loves to work on home projects, including board and batten installation, easy wood projects, a farm house light, and even chicken wire baskets. The Distinctive Cottage has a reputation for cottage style. The blog is a great resource for casual decor inspiration, including room guides, cottage decorating ideas, and color boards. Visit The Distinctive Cottage for design tips, rooms, inspiration boards, and more. 14. Erin at Two Story Cottage is working to make her new cottage house a home. Follow along as she learns to DIY in a livable, simple style for her family. Be sure to check out projects including a mantel makeover, shutter window treatments, and a reading nook for the kids. Learn about small house living from Claudia on the Mockingbird Hill Cottage blog. This resource shares rules for living comfortably in a small space, along with inspiring projects for cottage homes. See how she’s created a beautiful, charming space, complete with a garden, dollhouse, and personal studio.